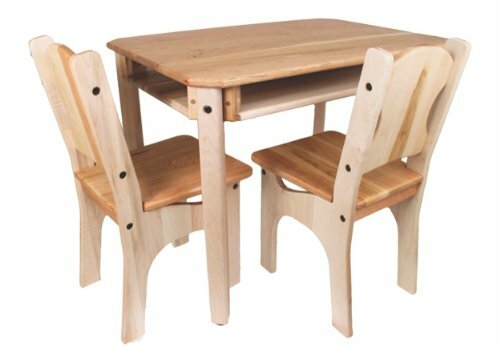 Kids will love these childrens table and chair sets to work and play on! They can eat snacks, do homework, play games and more on a table and chair that’s just their size. Kids will enjoy having friends over for “tea” parties and to work puzzles on their table and chairs sets, too, and if you home school, you know how important it is for kids to be comfortable while learning, and when they have a table and chair that’s their own size, they can focus and learn better. There are sets here made of wood, and some are made of durable plastic. Some are colorful, some are solid, neutral colors. You’ll find tables for toddlers and tables for older children, too. Some of these tables even feature beloved characters from kids’ favorite movies and TV shows. Place a table and chairs set for kids in the living room, their bedroom, a playroom, and anywhere else kids enjoy spending time. The sturdy, easy-to-clean plastic table and 2 chair set features a baseplate construction top with a light weight removable plastic cover that converts easily to an activity table perfect for lunchtime for two, story time or art projects. 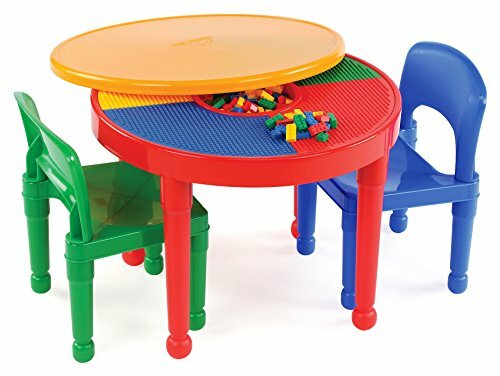 This table set features a recess in the table top for a storage BONUS for small construction blocks. 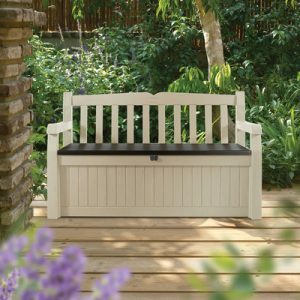 The sturdy plastic construction features easy snap together assembly. Includes 1 construction top table with storage area, 1 convertible cover and 2 chairs. These colorful table and chairs sets by Tot Tutors each feature 4 colorful chairs and a sturdy table for school work, crafts and playtime fun. Click on photos for details and pricing. 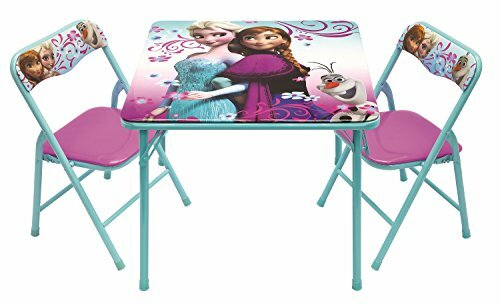 Now your child can play with her favorite characters, Anna and Elsa with the Frozen Activity Table Set. The Set comes with 1 table & 2 chairs. Bright colorful graphics & large table surface for drawing, eating & playing. Vinyl surface is washable. Made of sturdy metal tubular construction. Adult assembly required, tool included. Chairs include a Safety Locking Mechanism. Chairs have a recommended weight limit of 70 lbs. 24″ x 24″ Table with 2 Padded Chairs. Little girls will enjoy having a tea party or working a puzzle on this pretty Frozen table. 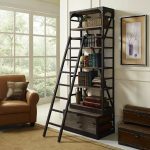 It’s ideal for playrooms, bedrooms, basements, and more. Kids can work and play on these Frozen tables. The first one comes with two matching chairs, the second one is the table only. 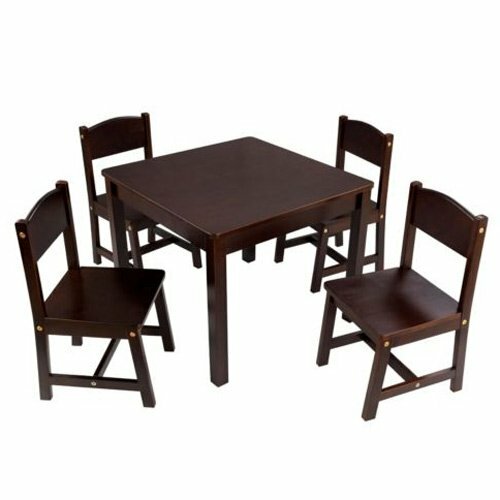 KidKraft’s Farmhouse Table and 4-Chair Set provides kids with a space perfect for playing board games, working on homework and much more. Sized perfectly for kids, this table is made of sturdy and durable wood. Other colors might be available, too. Click on photo to learn more. KidKraft is the maker of fine quality furniture and toys for kids, and these table and chairs sets offer something for every child. There are many styles and colors available, and kids will enjoy sitting at these tables for snacks, crafts, school work, and more. The Camden Rose children’s table and chairs feature rounded corners protect from sharp edges. Solid Cherry & Maple wood construction with Three BEEautiful Bees Natural Beeswax polish. Made in the USA by Camden Rose of all natural materials. Kids love having tables and chairs that are their size, and they will enjoy working and playing at these tables! Place one in their bedroom, the living room or a playroom.